. 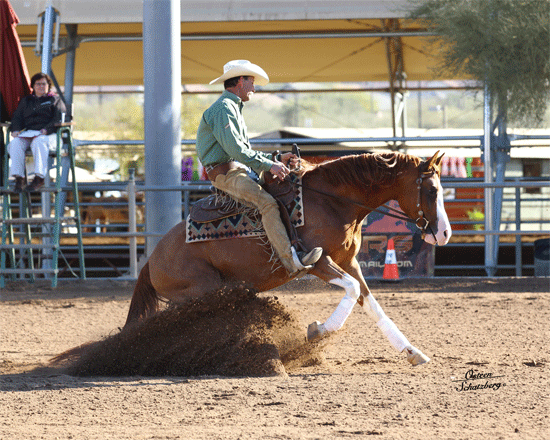 :: ARABIAN REINING HORSES SLIDE TO POPULARITY SCOTTSDALE, FEBRUARY 2013 ::. (Scottsdale, AZ) – The tenth Annual Arabian and Half-Arabian Reining Horse Futurities run February 14 through 28, 2013 at West World of Scottsdale during the Scottsdale Arabian Horse Show. Founded in 1998, the Arabian Reining Horse Association (ARHA) promotes the natural athletic abilities and versatility of Arabian and Half Arabian horses. This event pays some $175,000 in prize monies, plus saddles, trophies and buckles to Futurity winners. 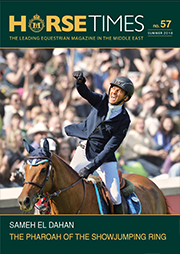 Currently the fastest growing of all Arabian disciplines, reining has attracted new participants even during the economic downturn. Reining competitions are all about action, not only on the part of horses and riders, but with a lot of vocal support from the audience. Competitors in each class ride specific patterns and are judged by their ability to ride that pattern as perfectly as possible. The horses are highly responsive to rider queues making this sport both a mental and physical challenge for riders. Four and five year old horses compete in Arabian and Half-Arabian Futurity Classic with elimination leading to finals classes in the Wells Fargo Advisors sponsored arena. The top one-third high-scoring horses from the first two go-rounds advance to the clean-slate, meaning no scores carry forward, final for both amateur and professional competitors. Limited Futurity classes run concurrently with the Reining Classic and are a jackpot format where competitors post additional money as demonstration of their ability to win. And you can not win if you don’t pay, as to be eligible to collect the jackpot competitors must pay the regular class fee plus an additional “Limit” fee of $500.00. All the fees are deposited in the jackpot so the more Limited competitors, the larger the purse. Amateur riders can also participate in the Non-Pro Futurity and a Non-Pro Derby. The Non-Pro Futurity is open to four and five year old Arabian and Half-Arabians with separate classes for each division, and run concurrently with the Open Futurity. A Non-Pro Futurity Classic entry is automatically entered in the Open Futurity with the option to enter the Limited Futurity class for an additional entry fee of $500, regardless of their wins. The Non-Pro Derby is for adult amateur riders with horses aged 6, 7 and 8 years giving a good reining horse an opportunity to successfully compete for a number of years and offering newcomers an affordable opportunity to buy an older well trained horse to start competing. Since its founding the Association has paid nearly $900,000 in prize monies during the Futurity Shows in addition to prize monies at regional shows. Funding is in part supported by the donation of breeding rights, called stud fees, to some of the industry’s top Reining horse sires in both Arabian and Quarter Horse breeds. Half Arabians are extremely popular as they combine the best traits of both breeds and make outstanding competitors. The popularity of Reining is evidenced by the official acceptance of the sport over 60 years ago by both the American Quarter Horse Association (AQHA) and the United States Equestrian Federation (USEF). In 1996 National Reining Horse Association (NRHA) held its first Futurity and from that event has expanded from the United States to include worldwide membership. The standards for competitions and many of the riding patterns established by the NRHA have been gradually incorporated in a number of other equine associations, including the USEF and AQHA. FEI World Equestrian Games,™ the international governing body for all Olympic equestrian disciplines and the World Equestrian Games, added Reining as a recognized discipline in cooperation with the NRHA in 2000. The NRHA’s Judging System is a highly acclaimed format for the judging of equine events that includes technical and stylistic elements coupled with considerable difficulty.